Family ReEntry and Fairfield County LOOK Team to Bring Criminal Justice Awareness to Greenwich Polo on August 27th! Greenwich Polo on August 27th! Insider: Polo and criminal justice seem like a very unlikely pairing. Can you explain the connection? Jeff Grant: Family ReEntry has been serving the needs of Connecticut families suffering from criminal justice related issues for over thirty years. We have had tremendous support from Greenwich and other affluent communities, yet most people still don’t recognize that incarceration-related issues affect everybody regardless of zip code. Our goal in this family friendly event is to create awareness, raise support and have a great time. JG: Elaine Ubina (CEO of Fairfield County LOOK) is very progressive and saw things imaginatively in inviting us to participate in the LOOK VIP tent. 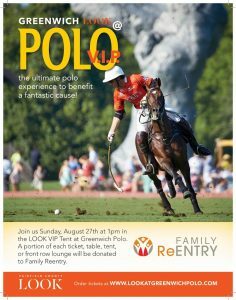 Family ReEntry jumped at LOOK’s very kind offer to be the nonprofit partner for the polo event coming up on August 27th. I: What can guests expect in attending the Family ReEntry polo event on August 27th? JG: In a word: FUN! My wife Lynn Springer and I attended polo in the tent in early July and it was a wonderful, casual, comfortable experience done just right with great food, drinks, music, friends, families, children – and even dogs (well-behaved ones)! And we even got to “stomp the divots” after the first half. If guests have never been to polo they will be in for a surprise – it was one of the most relaxing and enjoyable afternoons we’ve spent in a long time. I: How can guests participate in your cause? JG: First, join us on August 21st; a portion of proceeds from each ticket, table or front row lounge will be donated to Family ReEntry. But that’s just the start for people who want to get involved. We have opportunities to volunteer in one of our programs, be a mentor to a child whose parent is in prison, become an ambassador, attend an event to learn more about criminal justice issues – and of course we appreciate all donations. I: Why is this important now? JG: Family ReEntry provides critical, cost-effective services in areas including mental health, substance abuse, family counseling, domestic violence, fatherhood, mentoring, housing, employment, etc. These programs help prevent people from going to prison. As well, we provide programs to help people returning from prison (and their families) so they are less likely to return to criminal behavior and/or return to prison. But Connecticut’s fiscal crisis has caused a state-wide cut back or termination of many of these essential services. That’s why more than ever we need to rely upon private, foundation and corporate contributions. 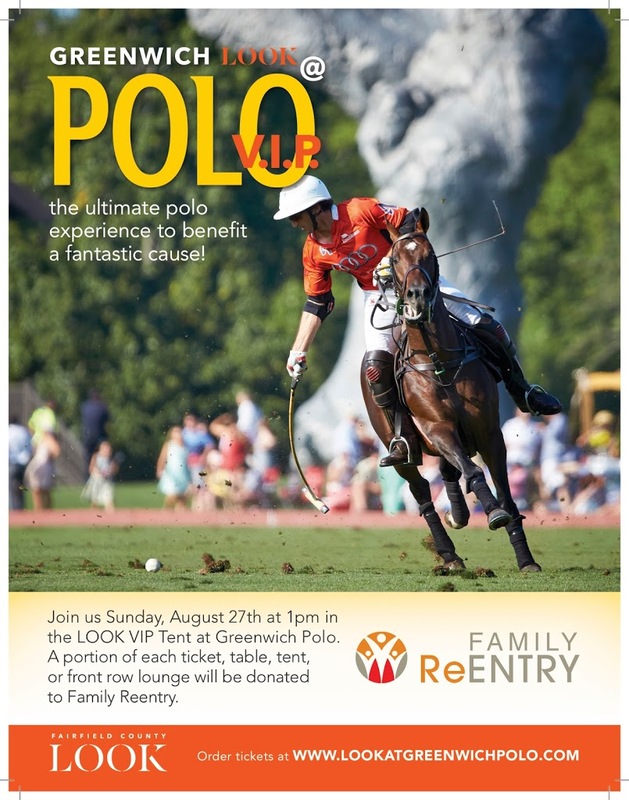 FRI: Can anyone get tickets for the Family ReEntry/Look VIP Greenwich Polo tent? JG: Of course. Admission to the LOOK VIP Tent includes food, drinks, music, shade, private restroom and special attractions, a portion of which is donated to Family ReEntry. It’s a family event – children and dogs are welcome! Ticket levels include VIP tickets ($200), Child VIP tickets ($50), group tables for ten ($4,000) and front row lounges for ten ($5000). All tickets can be purchased online here. FRI: When/where is the event? JG: Greenwich Polo Club, Sunday, August 27th, 1 – 5 pm, One Hurlingham Drive, Greenwich, CT (head north from the Merritt Parkway North Street exit). FRI: How can we make a donation even if we can’t attend? JG: Family ReEntry gratefully accepts donations on our website (familyreentry.org), or by check sent to: Family ReEntry, 75 Washington Avenue, Bridgeport, CT 06604. Family ReEntry is a 501c3 nonprofit, which was founded in 1984 as a reentry support group for men at the Isaiah House in Bridgeport. It has since grown to include policy advocacy, and intervention, prevention, in-prison, reentry, fatherhood and youth & family programs. Over the past 33 years, effective advocacy efforts and community-based programs developed by Family ReEntry have significantly reduced the likelihood that clients will re-offend, be re-arrested, or be re-incarcerated. Its programs provide a spectrum of services designed to disrupt the intergenerational cycle of incarceration. Family ReEntry addresses the specific needs of each client and their families through individualized case management and support services. It works to create a positive social network for each client, helping make their transition from prison back into the community a successful, self-sufficient one, while strengthening their families and the community. Family ReEntry operates its programs in strategic locations that encompass eight municipal regions and judicial geographic areas, two parole districts and five prisons. Approximately, sixty-percent of those served by Family ReEntry are from greater Bridgeport – Connecticut’s largest city. The organization has offices in Bridgeport, Norwalk and New Haven, CT. Programs are also held in Stamford, Waterbury, Derby, New London and Norwich, CT. More information is available at www.FamilyReEntry.org.